Soldiers with the U.S. Army and Royal Thai Army officially began this year's Hanuman Guardian training exercise with an opening ceremony held Jan. 28 at Camp Nimman Kolayut, Thailand. This year's training involved approximately 800 U.S. Army soldiers operating under U.S. Army Pacific Command and approximately 900 Royal Thai Army soldiers with the Headquarters of 2nd Infantry Division and the 12th Infantry Regiment. The training is designed to enhance military-to-military partnerships, interoperability and mission readiness. "Building on the success of past evolutions of Exercise Hanuman Guardian, this ninth iteration continues its focus on increasing readiness, interoperability and collaboration between our nations to achieve effective solutions to common challenges," said Brig. Gen. Andrew Preston, the Deputy Commanding General - Support for 25th Infantry Division. "I know we're about to roll-up our sleeves, work together, train and learn from one another -- developing our readiness and interoperability capabilities vital to the security of the Pacific region." Hanuman Guardian 19 provides opportunities for professional exchanges that strengthen military partnership through shared learning and training. Staff members will practice their functions at the battalion level with a combined arms operations scenario. A field training exercise will involve platoon and squad-level elements from each nation honing fundamental warfighting skills to enhance interoperability. "We expect to emerge from the exercise better trained than we arrived and to leave the Royal Thai Army confident in our solid partnership and commitment to support each other," said Col. Leo Wyszynski, the 1-2 Stryker Brigade Combat Team commander. "Our soldiers are ready to train hard and perform well. I know that they will make the most from this amazing training opportunity." This is an excellent opportunity for U.S. soldiers, many of whom have not been outside of the United States before, to work with foreign militaries, learn about different cultures, and understand the important relationships the Army has with other militaries, Wyszynski said. The skills that they grow there will benefit them throughout their career. The training involves aviation assets, counter-IED tactics, medical training and subject matter expert exchanges. 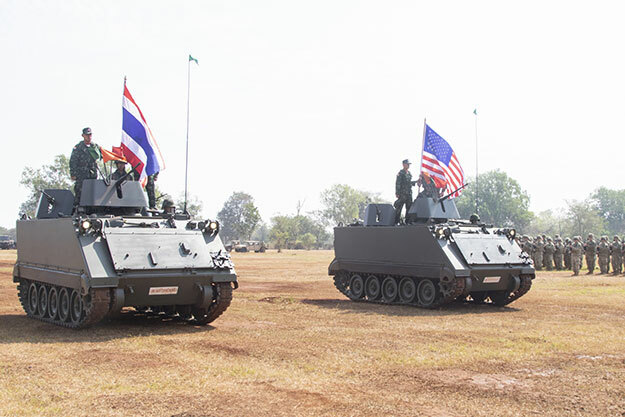 Soldiers will practice bilateral long-range fires integration, practice mechanized and wheeled infantry capabilities, and exercise logistics to determine compatibility between the U.S. Army and the Royal Thai Army. "This comprehensive training will further enhance our two nations' partnership and ability to work together to meet challenges in the region," said Preston. "The important relationships, interoperability, and combined capabilities needed to succeed in such an endeavor are built during exercises like this."